It has come to our attention that the London Jewellery School has been running online advertising campaigns that have used our trading name Flux Studios in the heading of their adverts, for an unknown period of time. 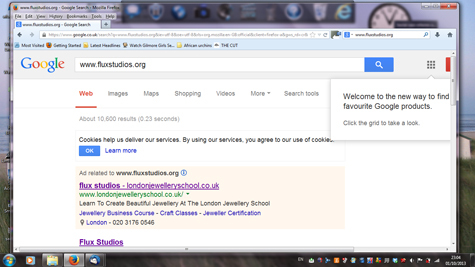 This is a screen shot of the Google advert run by the London Jewellery School, showing that Ms Jessica Rose has used Flux Studios as the leading title to her advert. The note to the right shows that Ms Rose has also paid for the use of 'Flux Studios' as a keyword search term. We have been made aware that people seeking to connect with Flux Studios through the internet have inadvertently connected with the London Jewellery School through these strategically placed adverts online. What purpose could it serve for the London Jewellery School to use the Flux Studios trading name as the introductory wording for their online advertising campaign? We wish to make clear that at Flux Studios our ethos and our activities are not linked in any way to the London Jewellery School. Flux Studios is a wholly independent jewellery studio and jewellery school with no connection to London Jewellery School whatsoever. If you have been misled into visiting the LJS website when looking for Flux Studios or if you have mistakenly joined their membership or courses we suggest that you take the matter up with Ms Jessica Rose at the London Jewellery School. On 4 October 2013 Ms Rose removed the advertising campaign at our request, also stating that she had ‘no want or need to dilute’ our ‘brand’ and will not run the campaigns again. As Ms Rose has declined to comment further it is unclear to us why LJS should feel it necessary to implicate our trading name and our reputation in the advertising of their own business. Ms Rose has made no acknowledgement as to the intent or potential damage this campaign may have caused to Flux Studios. She has also declined to reveal the length of time for which this online campaign has been running. We have been advised that this advertising campaign appears to mislead and divert the public from Flux Studios to LJS, however we have decided not to take legal action against the London Jewellery School on this occasion. We hope that in the future Jessica Rose doesn’t feel the need to use our business name to support her own business and activities. Flux Studios was established in 2008 to support all elements of the Jewellery industry. We are a wholly independent jewellery studio and school providing a professional membership scheme for jewellers who need specialist studio facilities to develop their businesses. We also provide a range of inspirational jewellery courses for the public to engage in jewellery making activities, to learn traditional silversmithing techniques with a contemporary influence.